I've been a booklover my entire life, and it shows. Even when I am travelling the world, having tonnes of cool adventures, catching up with terrific old friends, and seeing new places, I still find myself drawn to local bookstores. In the last couple of weeks of 2012, I was travelling in Europe, including Christmas in Lapland, and my first-ever visit to Russia. After a day of wandering beautiful and wintery St Petersburg with two good friends - a Kiwi and a Russian - I ended up browsing through the famous Dom Knigi bookstore on St Petersburg's main drag (Nevsky Prospekt). And what did I find in the Russian-language crime fiction section, but this little gem from a Mr Paul Cleave - the Russian translation of his debut novel, THE CLEANER (see photo above). 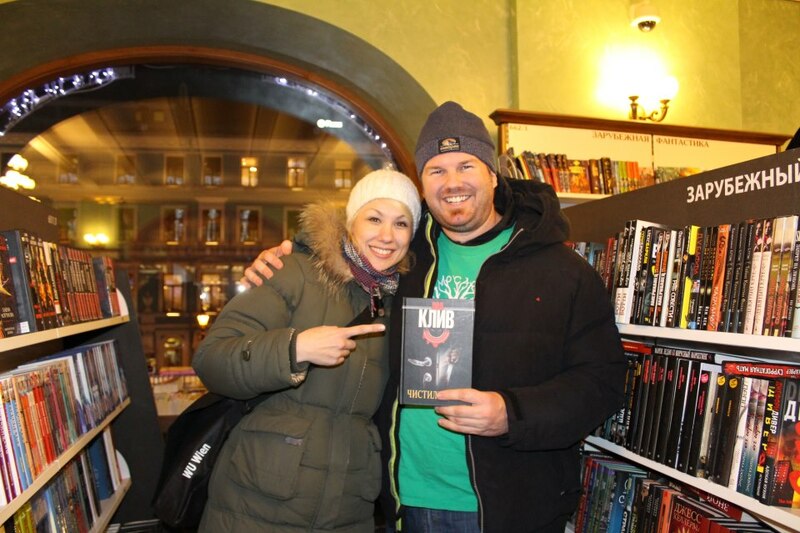 Nice to see Kiwi crime fiction being enjoyed all over the world! And my friend Anastasia (pictured) is pretty stoked to get to read about my country (particularly Christchurch) and its fictional criminal elements in her native language! Do you enjoy browsing bookstores, even when on holiday? What are some of your best finds overseas, in terms of bookstores and books? Craig - I'm glad you got the chance to do some bookstore-browsing. I do that all the time too, no matter where I am. San Francisco had some amazing book stores, but I did particularly enjoy City Lights. Not only did it have its wonderful history with the Beat poets, but it was a damn good book store with a downstairs basement bit that made you feel like you were exploring underground. I came away with several books and a book bag. Had to throw some old shoes in the rubbish so I could fit the books into my luggage allowance! Craig - I do not think there is a vacation in the last 35 years I have not visited a bookstore. When going to a city I look for bookstores online. I have a section on my blog for mystery bookstores I have visited. Next week my wife and I are going to Minneapolis which is the only city I know with two mystery bookstores. I expect to be at both of them. I visited the world's oldest bookstore in Lisbon a little over a year ago. The Lisbon Earthquake of 1755 destroyed its original home, but it's been in its current location in a very cool neighborhood since 1773.